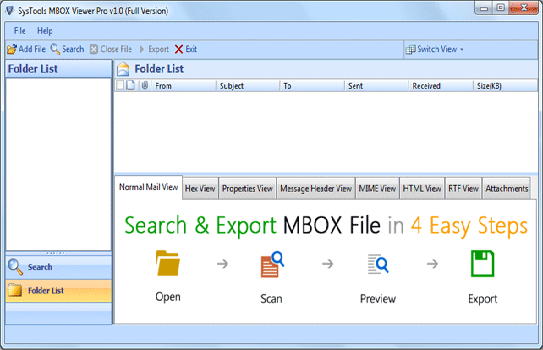 Many email clients create MBOX file to store user mailbox data on the user's machine. There are many Email Clients, which creates MBOX format storage. Some email clients create different types of files to store user data and some uses the same file type. Generally, many email clients use MBOX file to store user data. But MBOX file created by different email client use different structure to save mailbox data. Some use .mbox, while others store it with .mbx extension and some don't even use an extension to save user data. In case of crash of email client, you can open MBOX file to view emails. It scans selected MBOX file to open & read stored emails. It is possible to install this software without any having to fulfilling any additional set of system requirements and view the emails. This tool maintain folder structure and Email Status as same as stored in MBOX file. You will view your mailbox emails exactly the way they were in your Email Client. It maintains Signature & Status of Mails like Sender address, Receiver address, CC, Sending Time, Receiving Time, and Size of Email. The tool can select MBOX file automatically from its default location, all you have to do is to select email client and the rest of the work is done by the tool. Mozilla Thunderbird Email Client saves user data in two different files, one is having .msf extension & other file is without any extension. MSF file saves Header data of emails and actual data is stored in other file (MBOX) not having any extension. This software can open MBOX file of Eudora Email Client as well. You just need to select Eudora to read file from its default location. After a quick scanning process, you can view emails easily. It also read & view Emails from stored data in MBOX file of Entourage Email Client. You can view all stored Emails & attachments using this tool. MBOX reader can view The Bat Email Client data as well. This Email Client is not listed in this software list. However, you can open your Bat email on the software. All you need to do is select your MBOX file location at your machine. This software is free to download and use anywhere & anytime. This tool can help you in absence of Email Client at other machine in a very limited time to access Emails. You can easily download it and view your data within just a few minutes. It is a common format to represent Email Data File Format. This file format is used by 20+ Email Clients now days. Supported Email Clients are Thunderbird, Entourage, Eudora, PocoMail, The Bat and Spice bird etc. MBOX Emails are in the simple plain text message and all messages stored in concatenated form in MBOX file. I was having a trouble because I was not able to access my Emails cause to Thunderbird Email client corruption. Then I Google about Open Thunderbird Emails and I got this free tool. This was really a life savior for me at that time. Is MBOX Reader apply any file size limitations to read & open MBOX file? No, this software does not have any file size limitations. Can this software repair corrupted MBOX files? No, it does not have facility to repair corrupted files. Will this software let me save my mails in other file format like Outlook PST? No, This tool can help you to view your emails and attachments only. Hi, I am having a password protected MBOX file and I want to open it to view my Emails. Can I view mails from password protected MBOX file using this tool? Yes, you can view you Emails from password protected MBOX file with the help of this tool after scanning process. I use Entourage Email Client and I had a password protected MBOX file as backup. Once my Entourage got crashed and the MBOX file got corrupted too. Then I thought to access Emails from backup MBOX file. I was unable to access it cause of no Email Client. Then I searched on Google about this problem & I got this MBOX Reader. It resolved my problem within just a few minute at free of cost. Recently I had got into a big trouble cause of no access of Email attachments in Thunderbird. I was hunting for a viewer and I got this tool. It really resolved my problem like a piece of cake.